We're Gaga Over Yoga Ga DVD! It’s for mom and baby -- really! This DVD gives moms what you can't get anywhere else – a way to exercise and feel good while bonding with your baby. We here at LAPregnancy have reviewed many DVDS and there are few and far between to talk about (Baby Einstein is our pick of the crop!!) But Down Dog Productions' new DVD “Yoga Ma Baby Ga” has really done it!! 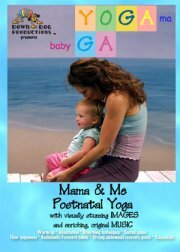 This DVD has a unique picture-in-picture format that really does let mom do yoga with her baby by her side. Mom follows the yoga routine in the lower corner of the screen AT THE SAME TIME your baby is engaged with stimulating images and enriching music that fill the rest of the screen. And you can even yoga with your baby in your poses... we tried it and both our babies and mom LOVE it!! Yoga Ma is the part that offers a complete 55-minute postnatal yoga routine focuses on those after-baby abs and suggests pose level variations for everyone from practiced yogis to inexperienced newcomers. Baby Ga’s the thought-provoking images and the enchanting, original music that somehow both encourage and soothe your little yogi. Together, “Yoga Ma Baby Ga” has it all. Once you try it, you won't want to exercise any other way! But, if you get the chance, you can ? you can watch the yoga full screen while baby naps or yyou can use the images and music alone for a pure baby experience. It's like 3 DVD’s in 1! Made by moms, for moms, Yoga Ma Baby Ga offers what you can't get anywhere else ? a way to take care of yourself soo you have more to give without ever leaving your baby's side! Yoga Instructor and Producer Jo Ann Colker Arison has been a yoga teacher since 1986. Her yoga roots include the privilege of studying with Billy Porter in LA, Earl Beeler in New York and Erich Shiffmann for the past ten years. However her real delight and transformation was the birth of her daughter, Alexandra Kaliray, and her focus for the last three years has been helping new moms recover and enjoy their bodies again with their babies.